Tiffany's Beach Cottage - Salt Rock Accommodation. Tiffany's Beach Cottage is across the road from the beautiful Tiffany's Beach which is great for surfing, diving, walking or just lounging around Granny's Pool. The Cottage is positioned one row from the beach with a large secure garden. The cottage is ideal for relaxing, braai-ing, lazing around or entertaining friends from the beach. The cottage has a 600 m2 level lawn and is the perfect environment for families to relax in or to soak up the beach feeling. 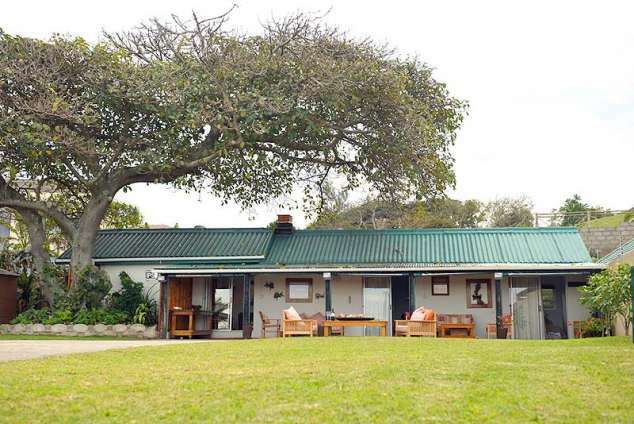 The accommodation consists of two bedrooms each with en-suite bathrooms and a separate guest toilet. Each room opens onto the covered outdoor stoep. The kitchen is fully equipped and boasts fresh coffee beans for a perfect cup of freshly ground coffee in the morning. The cottage is a self catering unit and all basic consumables are provided. 47984 page views since 27 May, 2010.